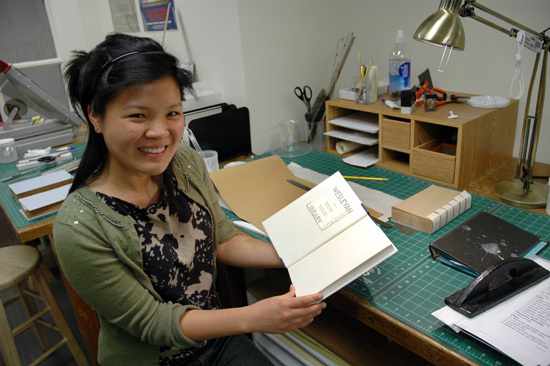 Michele Chun 07, who works in Olin Library’s preservation services, is one of 44 seniors who receive a bookplate label inside a library book, honoring their service to the library. In 2004, Michele Chun 07 became acquainted with the work of author Joy Williams. While studying abroad in Scotland that year, she read Williamss The Honored Guest, and its remained one of her all-time favorite reads. 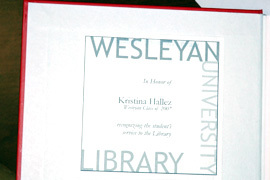 Chun and the other 43 graduating seniors who worked in Olin Library all receive a bookplate honoring their time at Wesleyan. The students all had the opportunity to choose the book title that their name would appear in. This is the third consecutive year that Olin Librarys Users Services Coordinating Group voted to have bookplates created for the graduating seniors. 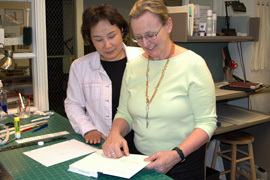 Michaelle Biddle, pictured at left, head of Preservation Services, used a drumming technique to apply acid-free glue to the bookplates back. The labels were printed in her office, keeping cost for the bookplate program at a minimum. Affixing the labels does not decrease the value of any Wesleyan publication. The bookplaces, made of a traditional acid-free, laid-line and chain paper, can easily be removed and leave no scaring on the books inside cover. Our books are read and loved. Because the labels are so handsome, these books will probably increase in value, Biddle says, gluing down senior Melissa Mondesirs label to her book choice Breath, Eyes, Memory by Edwidge Danticat. Mondesir worked in the librarys Circulation Department since her sophomore year. Reservation Services student Talya Zemach-Bersin 07 decided to have her bookplate mounted in a senior thesis titled Gustav Mahler : An Essay in the History of Music. Although the American Studies major hasnt fully read the essay, it has sentimental meaning. The thesiss author, Harvey Fischtrom 55, is Zemach-Bersins grandfather. (More on Zemach-Bersins story will appear in the May 16 edition of the Wesleyan Connection). Other book subjects spanned the gamut from Arie Eernisees had her bookplate affixed in Chinese Democracy after Tiananmen; Kristen Smith selected, A Walk in the Woods; Sean McClellan chose, Abortion and the Politics of Motherhood; Daniel Zolli picked The Da Vinci Code by Dan Brown. Zollis name is the second to appear in The Da Vinci Code. Library student worker James Wallace also left his nameplate in the hardback when he graduated in 2005. Once and a while two or even three students choose the same book, and that shows that that particular book was really popular, Lee says. Although the exact years are unknown, Lee says the bookplate tradition originated many years ago. In 2005, the idea was revisited when Preservation Services student worker Danya Sherman 06 was taking a typography course at Wesleyan. Biddle asked Sherman if she could create a 21st century bookplate design. One hour later, the design was completed. The same design has been used for the past three years. During Reunion and Commencement Weekend, Lee hopes the seniors will bring their families to the library and show them their name places and book choices. And when they return to campus as alumni, maybe with their own families, the books will always be on the Olin Library shelves for the former students to revisit, Lee says.